(Newser) – Sportscasting legend Bob Costas has parted ways with NBC after 40 years—and he's got a few things to get off his chest. Costas tells ESPN that he was pulled from the network's NFL coverage after repeatedly speaking out about the concussion crisis and the league's handling of it. Costas, who dealt with the issue more than once on Football Night in America, says he first realized his "position was untenable" when the network refused to air a 2015 monologue in which he spoke of the link between football and brain damage, Slate reports. He says NBC told him they couldn't air it because they were in talks with the NFL over Thursday Night Football. 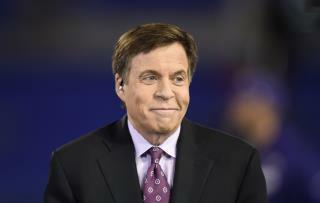 Costas says his final football broadcast was to have been the 2018 Super Bowl—but he was pulled from the broadcast after speaking about concussions again at a University of Maryland appearance in Nov. 2017. He's gone because he's an anti-gun nut who pissed off most of America on Sunday Night Football. I know about concussions because I've had at least 6 of them. I have problems because of them - balance, memory, head pain. Only 2 were from football. 1st one was 6 years old, fell off kitchen counter and mom had to keep me awake for a long time. 2 in 9th grade football. Headaches for at least a week. Another on pond ice - hockey ! And 2 more with go-cart crashes - one head on that hurt more than anything else...and I was in my 40's. Another one on a fall onto concrete with the head bounce. Ouch ! I'm still gettin on but I know all about the damage that concussions produce. Bob Costas is doing a service by calling out the NFL. He's speaking for the people that are hesitant to speak the truth to power !